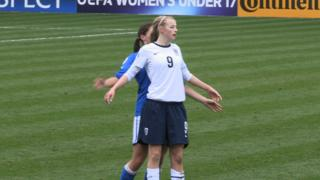 England international Alex Scott reports from the opening game of this year's Women's Under-17 European Championships, which saw the hosts take on Italy. The event, which runs until 8 December, sees teams from all over the Continent play at grounds such as Hinckley stadium and at the home of Chesterfield FC. For information on how you can go and see any of the nations in action, including England and Scotland, check out the UEFA website for details. BBC School Report have also been down to get a flavour of the tournament, see some of their pictures here.